This page lists important information for seniors on estate planning and explains issues they may face with their heirs and caregivers. If you are a senior and have at least one child, it is very likely that at some point you will be approached and asked to sign estate planning documents, such as a Power of Attorney, will, living trust or deed. Usually, when your family members encourage you to make an estate plan, they are simply trying to help. Unfortunately, there are always instances when someone with bad motives uses estate planning as a way to gain control of your property or other financial assets to guarantee they will receive an inheritance. If you are placed in this type of situation and feel pressured, don't take any action without educating yourself first and getting independent legal advice from a lawyer. When you speak to an attorney, make sure the attorney agrees to only represent you, not your children or other heirs. Speak with your attorney privately and ask for guidance on estate planning and the probate process before any documents are signed. See also power of attorney risks. If you are concerned about how to pay for long-term care or assisted living, the earlier you start planning, the better. The starting point is to gather information, learn about your options, then talk to a professional. There is a lot of free planning information on the Web. If you do not have enough money to pay for nursing home care, educate yourself about financial planning options, long term care insurance, and Medicaid Planning. Could Your Heirs Use a Conservatorship to Take Away Your Property? Seniors today are living longer and facing a variety of health conditions that can affect their ability to perform daily tasks independently. Seniors need to be aware that their children, siblings, and other heirs can sometimes try to use such a health condition as a way to gain legal control over the senior's property. The best way to protect yourself and maintain your independence is to be informed. To learn about what a conservatorship is and how it could affect your legal rights, refer to our Conservatorship page. Seniors should be aware that they are vulnerable to involuntary conservatorships, guardianships, and related types of actions. For more free information on estate and financial planning, go to tips for seniors. A common issue seniors face is whether to change their will or living trust to disinherit an adult child, grandchild or other relative. It is not unusual to think about adding someone new to your will because that person has been very helpful to you during a difficult time. When considering how to distribute the property you have accumulated over a lifetime, there is no right or wrong answer. There are, however, many issues to consider. If you are considering making a codicil to an existing will or executing a new will, see how to change my will and review our page on codicils and amendments for helpful information. If you are struggling with the issue of leaving your estate to your children in unequal shares, see our estate planning article on unequal shares. 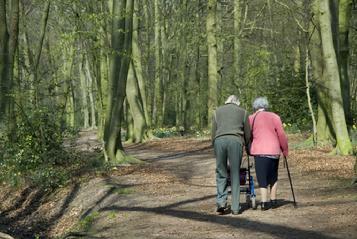 Many seniors have concerns about living with Alzheimer's Disease and dementia. Statistics show these conditions are going to affect an even greater segment of our population in the future. Can you still execute a will or living trust if you are in the beginning stages of Alzheimer's or dementia? Find the answers on our dementia and wills page. Deciding where to spend your retirement years can be gut-wrenching. Everyone seems to have an opinion about what you should do, but what do you really want? There are many factors to consider, such as state income taxes, property taxes, access to health care, climate, home prices, quality of life, and state inheritance and estate taxes. Living near your children, siblings, extended family or close friends can provide a support system that is essential as you become more dependent on others. When considering your estate plan, keep in mind that the laws of the state where you are domiciled will apply to the administration of your estate, including inheritance rights of your heirs. Could Downsizing Now Help You Maintain Your Independence? One of the primary reasons many seniors are forced into assisted living facilities and nursing homes is they become unable to maintain their house or farm. When a large house or piece of land becomes a burden to maintain, seniors are often moved into an assisted living apartment or long-term care facility as a way of alleviating that burden. One of the best ways to stay in control of where you live throughout your senior years is to downsize long before your current residence becomes too much for you to maintain.